We regret to announce that for various reasons, Taunton Activist Collective is currently a no longer functioning or active collective, and is therefore in hibernation. This is due to members moving away, and lack of individuals involved directly with organising D.I.Y. activity within the area, as well as administration of this wordpress and the email account tauntonac@riseup.net. Taunton Vegans remain an active group promoting veganism and campaigning against animal cruelty. ‘Taunton Squatters’ are no longer active (although squats are likely to appear in the future by others). Anonymous Promotions are currently taking a break from Taunton, but active elsewhere in the South-West. Autonomously organised anti-cuts activism seems to no longer be happening (to our knowledge). It’s been a while since our last update, so here’s the next one for you folks. With a new distribution launched, and zine on its way, featuring anarcho-punk and radical politics; we thought we’d better get started raising funds for our own causes. First up is the Anonymous Distro benefit; our first show returning to The Pen & Quill, after re-opening under new ownership. Returning a year since their last show in Taunton, Somerset’s best-known ska-punk outfit King Tuts Revenge will be headlining to promote their forthcoming album. 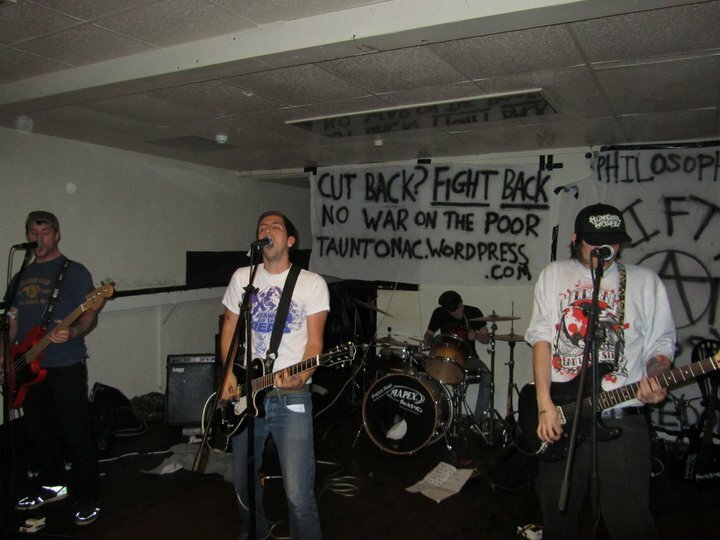 Sharing the stage are Room 4 1 More, known for their previous pop-punk visits to Somerset, and everyone’s favourite anarcho-punk and poetry infected duo 51st State. This show is tonight! Naturally: apologies for the late update. Next up is the benefit/release for Dissident Culture zine on August 18th. As the zine nears completion, and printing and distribution is prepared for next month, we’ve organised a ‘local night for a local zine’ to make this happen. Officially headlining for the first time in their adopted hometown of Taunton, the latest Riot Ska Records (our latest allies*) addition Po-lice will be thrashing out their chaotic skacore. Returning also to the Pen & Quill are farmer shoutin’ anarcho-punks Rat Bandits and well-established radical acoustic Dane Howells, while Bridgwater’s crust militants Sickpig make their Taunton debut. This will also possibly be our last Taunton show for sometime, and not to be missed! Update: We have removed our support for this event, as we have been told we are not formally invited; given that we are not all registered members of the unions who have organised the rally. Apologies to any confusion caused. Alternatively there is a march in Bristol, with a claimants feeder march leading into this. Come and join us at these instead! 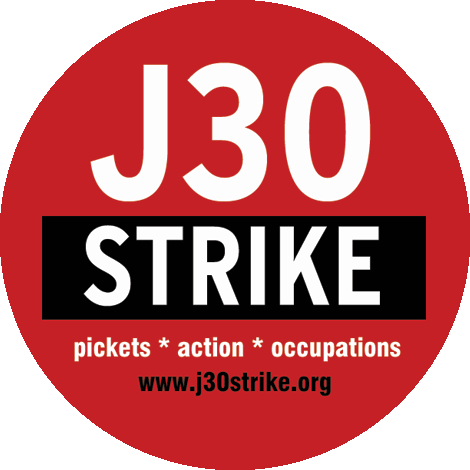 As part of the national day of action against austerity measures (see J30 Strike website), unions have called for a rally at the Taunton rugby club, Hyde Lane, TA2 8BU, starting at 11am. Anonymous Distribution Launched & Zine Coming Soon! 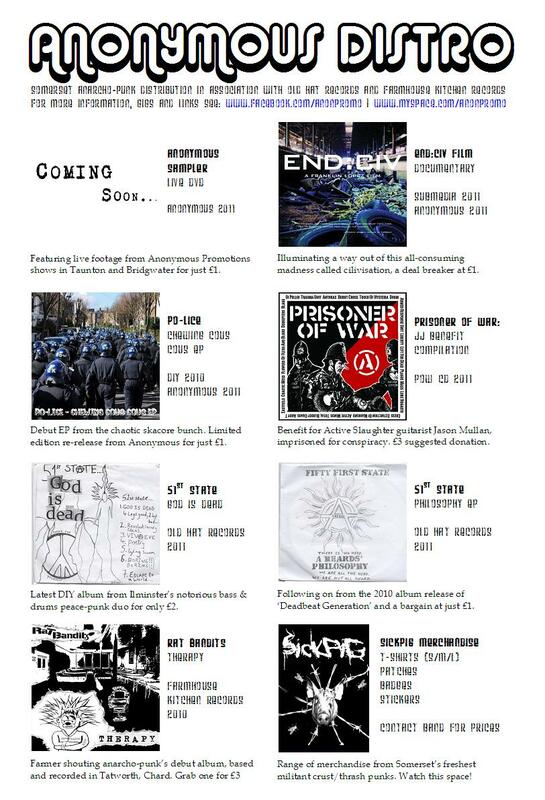 New distribution launched from Anonymous Promotions featuring Somerset anarcho-punk releases, as well as a new radical documentary End:Civ. It will be available at punk shows and other events, so ask around if you’re interested! Additionally a new Somerset Punk Zine is coming soon from Anonymous and other contributors, so far featuring; Cut Cameron Festival, Taunton activist news, JJ’s imprisonment, CD and gig reviews, interviews with Sickpig, 51st State, Rage Taunton and more; news from Bristol, Taunton Vegans, Stop Hinkley campaign, Somerset punk uprising and history, repression over mini-UKTek, Vivary Green Wedge campaign, artwork, poetry + much more. It will be released in August 2011, with a benefit and release gig on the 18th. Thank you to everyone that supported! We all had a great time last Saturday and raised enough money for the collective to print hundreds of newsletters, make more anti-cuts banners and even fund a new Somerset Punks Zine. Merchandise was on sale from a new Anonymous/Old Hat distro featuring a benefit compilation for Active Slaughter guitarist JJ, 51st State cds and Sickpig’s new range of badges, stickers and patches. Additionally Officer Down brought their EHC distro and lots of literature was taken during the night including our new newsletter, “no comment” (a defends guide to arrest) and 1831 from Bristol Afed. We have a new newsletter! To read/distribute please click here. This has been launched for our benefit gig on Saturday, featuring; the recent vegan fayre, a report on Cut Cameron Festival, anti-cuts campaigning, squatting in Taunton, plus more. Only a year after the first innovation of Taunton Vegans (originally set up after the success of a Vegan Food Fayre in 2010) the group managed to bring festivity, open-minds and positive awareness to their hometown, by hosting their own Vegan Fayre this spring (see pictures). On the 14th May, members of the community were invited to a day of live music, entertainment, and of course delicious vegan food, at North Street Church Hall. Greeted by friendly cows and enthusiastic leafletters, the fayre attracted the attention of the public towards an alternative, cruelty-free lifestyle; stalls such as Bristol Animal Rights Collective (BARC) and Hunt Saboteurs Association (HSA) provided information regarding animal welfare, and impressive cooking demos from Viva! had everybody watering at the mouth.